Is the WWE Ready for Evolution? 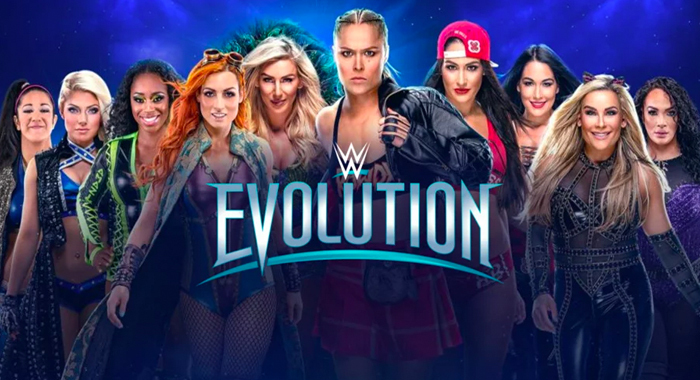 WWE Evolution happens this weekend but their track record raises a few questions. Will the women perform to their full potential? Can WWE pull this off? Is the women's division ready for a pay-per-view? The WWE doesnot exactly have a good track record with trying out new things for the women. Can the WWE pull this off? As mentioned above, the WWE does not have a good history with their women and their pay-per-views as they do with their men. First example will be the Miss WrestleMania match. A match that could have been monumental for the women, became a joke when WWE booked Santino Marella to win. Example number two is the debut of former UFC Champion Ronda Rousey after the end of the first ever Women's Royal Rumble match. The WWE was doing good that night by booking the match in the main event, but lost the grace by having Rousey's debut overshadow the accomplishment of all those thirty women. They would then proceed to boast about just Rousey. This coming pay-per-view would be either a complete success or disappointment. Is the Women's Division ready for the pay-per-view? The women's division usually do not have a lot of time on TV. A good night is two matches and three is even better. The timing of a match is also crucial. They cannot have a match be too short, that’s what started the whole “give Divas a chance” movement. They do not want a match to be too long as well because it will feel like it is dragging on and on. An entire three hours of nothing but women is completely new for the audience. Sure there is the Mae Young Classic but those are weekly shows that don’t go as long as a pay-per-view. The women have a lot of work to do to pull this off and keep the fans entertained. Another aspect of the pay-per-view that could be disappointing is the match card. Nikki Bella has been gone for a year and gets the main event shot at the first ever women’s pay-per-view without really earning it. There is a Battle Royal to showcase the women from the past and present, but that stipulation seems too small for a history in the making pay-per-view. The WWE should have a match with a stipulation that can showcase all the women that the fans won't always see on a weekly show. Battle Royals are too common. Another Royal Rumble would be good or even a gauntlet match. Even better, why not make a new stipulation exclusively for the pay-per-view and call it Evolution? If the women are successful this could bring more opportunities. There could be more women pay-per-views or specials, or even an all women show, like GLOW. With all the odds against the event, here's to hoping that the women put on one hell of a show. Will WWE Evolution be a success? Are they ready for an all-women's pay-per-view? Leave a comment and let us know your thoughts. ​For more Wrestling News, click here for the latest updates.